Africa contains two desert regions, the SAHARA DESERT in the north and the Namib-Kalahari region in the southwest. Traditionally, very few people have lived in Africa’s deserts. However, some groups inhabit the semiarid lands bordering deserts—areas that are somewhat wetter than the desert. The well-being of these people depends on rainfall, which varies greatly from year to year. With an area of about 3.3 million square miles, the Sahara is the world’s largest desert. Its extreme dryness (less than about 5 inches of rainfall per year) has long made it a barrier between the Mediterranean world and sub-Saharan Africa. Nevertheless, through the ages nomads and traders have crossed this formidable desert. Most of the Sahara consists of rock or gravel plains, with several large mountain masses. About 20 percent of the desert is covered by seas of loose sand, called ergs, that form “living” dunes. Moved and shaped by wind, these dunes reach heights of more than 500 feet. The SAHEL, a semiarid region along the southern border of the Sahara, contains large areas of ancient ergs with “dead” dunes that are held firmly in place by vegetation. The Sahel generally receives from 4 to 8 inches of rainfall annually. The Namib is Africa’s only true desert south of the equator. It stretches along the Atlantic coast for 1,240 miles in a long narrow band. The driest part of the desert, by the coast, receives less than half an inch of rain per year, though moisture from fog and humidity supports some plant and animal life. To the east lies the KALAHARI DESERT, a vast and featureless red sand plain that is really a semiarid region rather than a desert. Before Europeans took over the continent, Africans had learned to cope with the climate of deserts and semiarid regions. Small, nomadic populations inhabited many dry areas. European colonial rule brought fixed national borders, which made it difficult for nomads to travel freely. Since the mid-1900s, as African populations have grown, many people have moved to crowded urban centers. With the best agricultural land already occupied, others have migrated to drier and less fertile areas, such as the Sahel. This population movement has caused more Africans to face the hardships of drought and desertification—the spread or creation of a desertlike landscape. Drought is a prolonged period of reduced rainfall or of altered rainfall patterns, as when the rain falls at the wrong time of year for local crops. 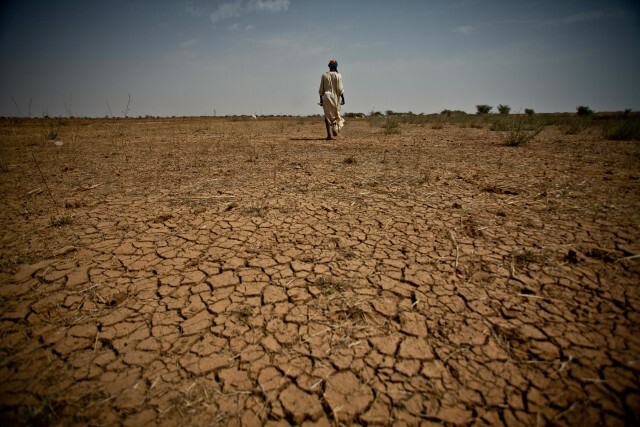 In modern times the western Sahel has seen three major drought periods: 1910–1914, 1941–1943, and 1968–1985. Devastating droughts have also occurred in southern, eastern, and northeastern Africa. Some of these have led to severe food shortages and famines, effects that worsen as Africa’s population continues to increase.